PLEASE NOTE: I reference a video tutorial in the written pattern below, it is currently saving to my computer then will be uploaded to youtube. I am releasing this written part early so you can get started. As soon as the video is ready the links will be added to the pattern. Check back for updates. I designed Mini Pooh for the Floating Hunny Pot but you can make a regular bear instead by choosing different colors to make him with. 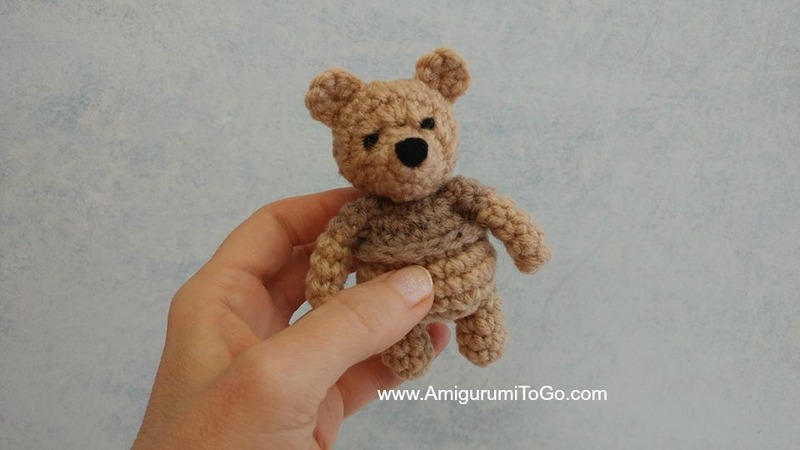 The brand and type of yarn you use will change the size of the bear. 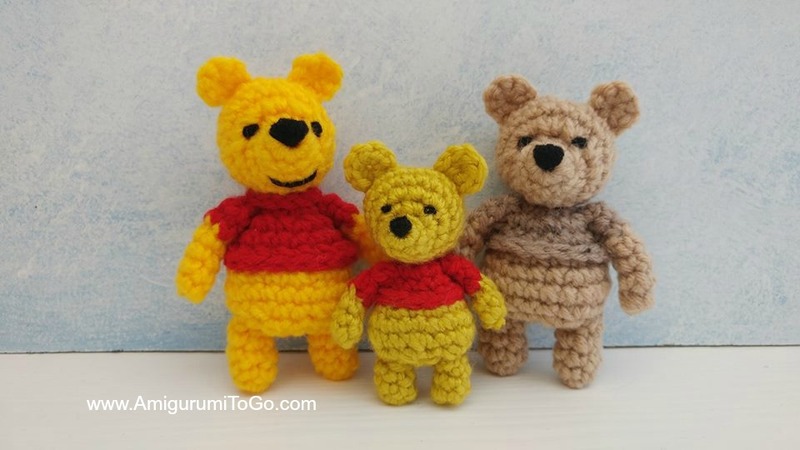 All 3 bears pictured are made from a worsted weight yarn and a 3.75mm hook. Please keep this in mind when choosing your yarn. 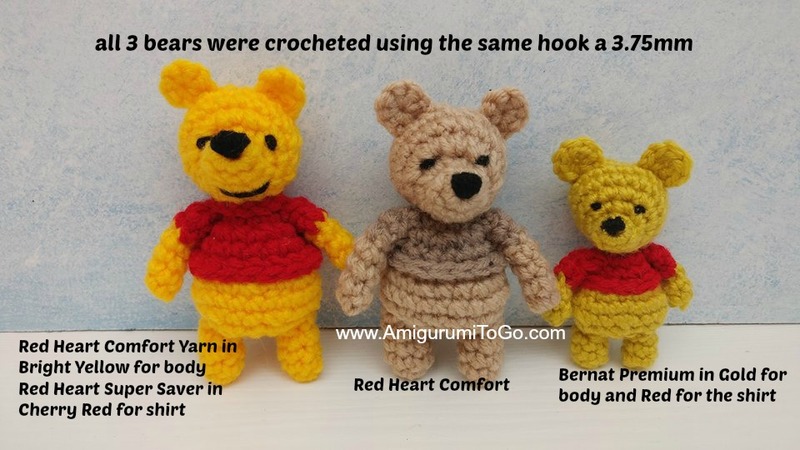 The bigger bears were crocheted with Red Heart Comfort, the smaller one was crocheted with Bernat Premium (an ultra-soft yarn). 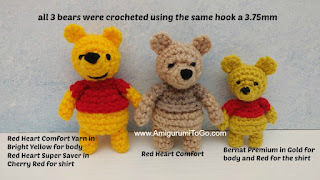 DO NOT use a bigger hook if you are making this bear for the Floating Hunny Pot or it will not fit in the pot. All the bears pictured do fit in the pot, the bigger 2 fit just right, the smaller one has room to spare. you can use yarn for eyes or dot in the eyes with black paint. 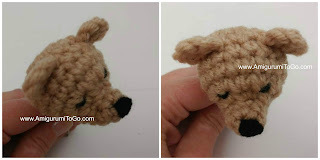 3.75mm hook *do not use a bigger hook if you are making the bear to fit inside the pot. How to read the rows that work in the round: Mark off the last stitch and move that marker at the end of each row. Each row has a sequence. Example: 1sc then 2sc in next st means repeat that sequence 1sc then 2sc in next st followed by 1sc then 2sc in next st over and over to the end of that particular row. Some rows will have instructions that take you right to the marker. The number inside the parentheses ( ~ ) is the number of stitches you should have at the end of that particular row. this page, please scroll up and read it. There's important information about the yarn you choose and the size of this bear. 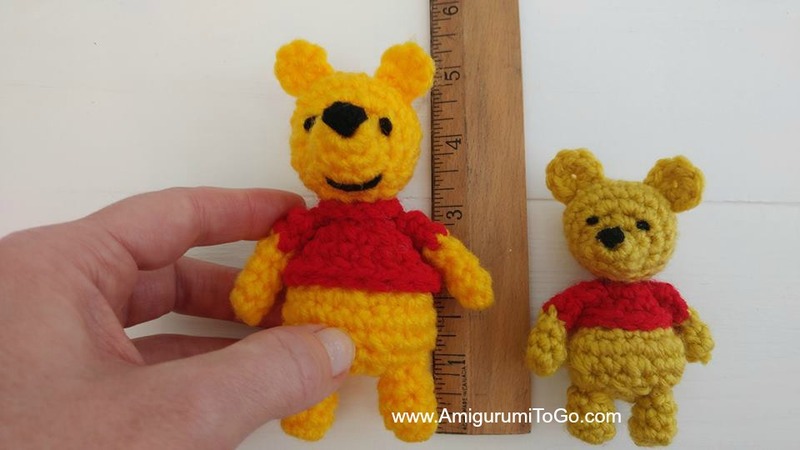 Head: Starting at the tip of the nose with yellow (I'm referencing Pooh bear for colors, use any color of your choice) Need help crocheting the head or getting it started? View part 1 of the video tutorial found here. f/o leaving a tail for sewing. Weave in and out of the remaining FLO then stuff and shape the head. Use a stuffing stick or the back end of a pencil to get the stuffing where needed. Pull yarn tail to close gap then carry the yarn tail through the head and out through the neck area. Knot off, carry the yarn tail through the head one more time, pull slightly then cut. f/o leaving a tail for sewing. Pull starting yarn tail tight to close up the gap. Assemble the head before sewing to the body. Carry the yarn up through the neck and out through the center hole or row 1. Wrap around the top of row 1 a number of times until you have the size of nose you want then back down and out through the neck, beside the stitch hole you first went through, knot the thread tails together. You can use one of the tails to make the eyes if it's long enough and also the mouth. Not all my bears got a mouth. If you want to add one, using one of the black yarn tails bring the needle through in between the 3rd and 4th row. Make any size of mouth then back down and out through the neck. Knot off. Mark the eye spots using round head stick pins if you have them. This is helpful when trying to picture how the eyes will look in different areas on the head. Carry the yarn up and out in between the 4th and 5th row, wrap a tiny spot for the one eye then bring the needle out through where the other eye will go, wrap the spot then carry the yarn back out through the neck area, pull lightly! Knot both yarn tails together then carry them away from that area and cut free. Ears are sewn in between the 7th and 8th row with 2 visible stitch holes between them. Be careful as you are sewing not to pull the head out of shape by pulling too tight on yarn tails. Set head aside until the legs are sewn onto the body. f/o leaving a tail for sewing. Weave in and out of the remaining stitches then stuff and shape the body. 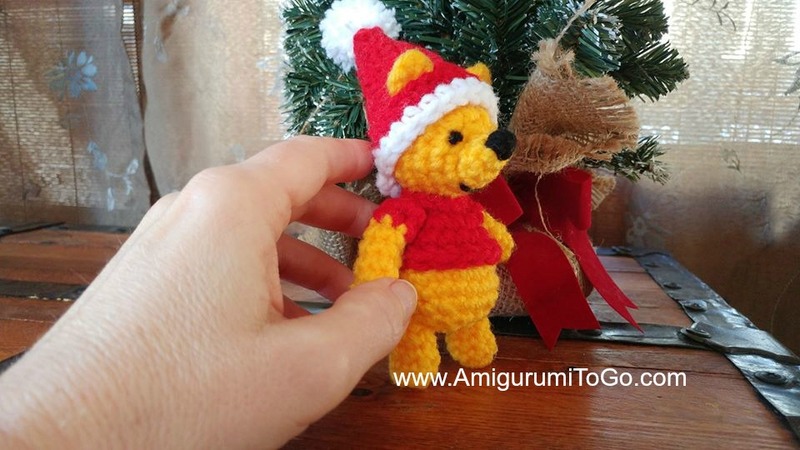 Depending on the brand and type of yarn you are using, IF you are making this bear for the Floating Hunny Pot then you need to check while stuffing the belly if the belly will fit into the pot. One of my bears needed to go on a crash diet and loose a couple grams so he would fit. You can also stretch out the pot too! So before thinning the belly try stretching the pot and see if that helps. Once the body is stuffed, pull yarn tail to close gap and knot off. Leave the remaining yarn tail for sewing. 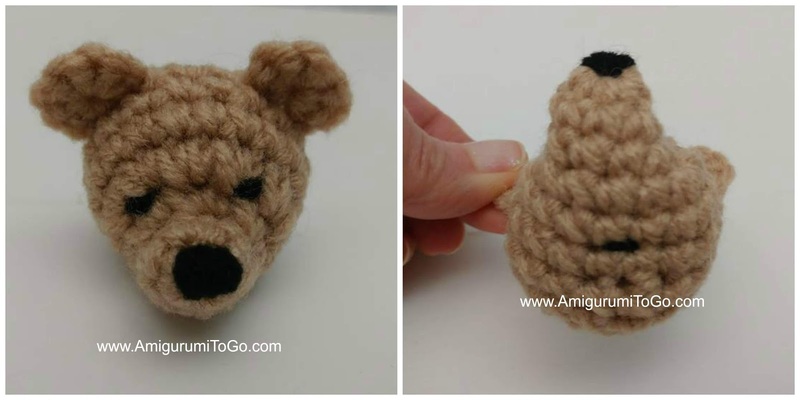 You will use this yarn tail to sew the head and body together. sl st next st then f/o, tuck yarn tail into the arm. sl st next st and f/o leaving a tail for sewing. The area you f/o will be the area you sew towards the body so you do not see any uneven parts on the outside of the arm. Assembly: Part 2 of the video tutorial goes over the assembly, closer to the end. If unsure about any of assembly please view the video. 1) Sew the legs to the body. Find the spot that you f/o on the shirt, make that the back of the body. The legs are sewn on each side of the body. The outside of the leg should be sewn in between the 4th and 5th row first then sew the rest of the leg to the body. 2) Sew the head and body together. There's 2 ways to sew the head and body together. The first way is great for those bears that will be mostly just looked at or gently played with. First way: Bring the yarn tail from the body and in between the 5th and 6th row of the neck and out through the top of the head. Then bring your needle one stitch over and back through the top of the head, through the neck, through the center of the body and out between the legs. Pull until the head and body are fit snug together. Do not pull so tight that you pull the head out of shape. If you pull any stitches down on the head, reach in there with your yarn needle and pull them back out. Bring the yarn tail through the body and out the top of the head again. Do this 2 or 3 times until you feel the head is secure. It will twist side to side but should not lift off the body. Once done, knot off and hide yarn tail inside body. Second way: Sew the top of the body to the neck, adding a few stitches all around the area and pull tight to keep the head from moving. When I sew mine I sewed from to back then side to side and then a stitch in between all 4 so that the stitches crisscross. If you end up seeing the stitches you cam make a collar by chaining a length (about 11 chains, it could vary from bear to bear.) using the same color as the shirt that will fit around the neck and sew it in place. Do not pull the chain too tight around the neck, just wrap around and sew the 2 yarn tails into the body. The collar will cover any exposed stitches. 3) Sew the arms in just under the head and in line with the legs. Sew the top of the arm first then add a holding stitch from the bottom of the sleeve to the body to keep the arms from sticking out. 4) This guy in the assembly photos didn't need a collar but if your bear could use a collar, chain a length that fits around the neck and sew it in. 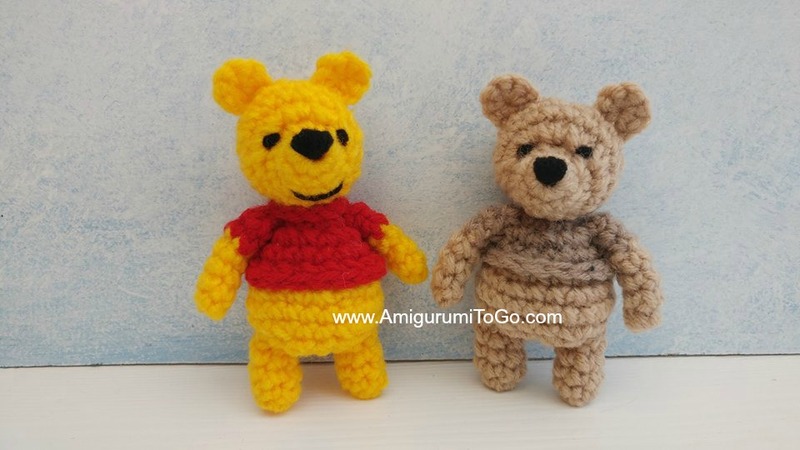 Winnie the Pooh bear got a collar added. You're done! If you enjoyed this pattern, please consider a donation. Any amount helps keep this blog active. The donation button is up at the top of this page. Also, there is a Christmas hat for this bear, please check back for that link. UPDATE: The Hat pattern is here. He is so adorable! Thank you so much for sharing your wonderful, fun patterns! This is the cutest!! Thank you so much for all your amazing tutorials. I have been attempting to make your sleepy dragon still working on it! I have 3 young grandchildren 2 boys ages 2 & 5 and they both love Winnie the Pooh! He will be well loved. Thanks for this amazing pattern and tutorial Sharon! I wanted to make this one for my daughter along with the cap and scarf. Please let me know how to make a bigger sized bear ,cap and scarf. Thank you for your pattern! I really like it! which mini bunny? and did you mean to write "pattern"?